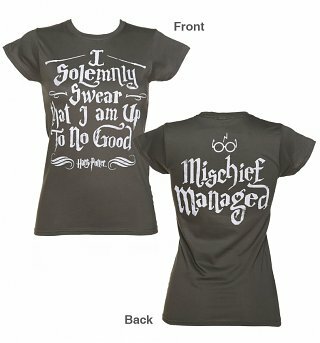 Customer Reviews of "Women's Charcoal Harry Potter I Solemnly Swear Mischief Managed T-Shirt With Back Print"
Little bit expensive but good quality and fits well. As a size 14 I ordered the XL to fit 14/16, it was tiny! Sizes are too small on this style. As usual, good quality, quick delivery. Flawless service, quick arrival, size is exactly as hoped for, nice fabric. My order arrived quickly, and the T shirt looks awesome.